The principal functions of the musculoskeletal system are to support and protect the body and to bring about movement of the extremities for locomotion and the performance of tasks. Bone is composed of an organic matrix that consists of collagen fibers embedded in a cementing gel made up of calcium and phosphate. Bone is an actively changing tissue constantly undergoing remodeling while reappropriating its mineral stores and matrix according to mechanical stresses. Normal bone is composed of collagen fibers aligned parallel to the tension stresses to which the bone is exposed. The long bones in adults are composed of tubes of cortical, or compact, bone surrounding a medullary cavity of cancellous, or spongy, bone. Cortical bone exists in areas where support is necessary, whereas cancellous bone is found in areas where hematopoiesis and bone formation occur. In cortical bone, the bone cells, or osteocytes, are enclosed in lacunae, which are spaces in the sheets of bone tissue called lamellae. Several lamellae are arranged concentrically around a vascular channel and are termed a haversian canal. In cancellous bone, the lamellae are not arranged in haversian systems but are organized into a spongy network called trabeculae. These trabeculae align along lines of stress. The ends of the long bones, called epiphyses, are expanded near the articular surfaces and are composed of spongy bone. The shaft of the long bone, the diaphysis, is covered with a layer of periosteum. The inner cavity of the long bone is lined with endosteum and is filled with marrow. For a period of time, a layer of cartilage exists between the diaphysis and the epiphysis. 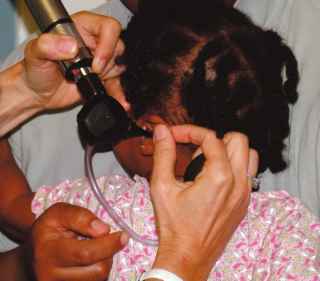 This cartilage is known as the growth plate or epiphyseal plate. The purpose of the growth plate is to determine the longitudinal growth of the bone. The parts of a long bone are illustrated in Figure 20-1. Cells in the periosteum can develop into osteoblasts, which lay down new bone, or into osteoclasts, which resorb bone. Trauma, infection, and tumors stimulate the development of osteoblasts. Osteoblasts secrete the matrix that is refashioned into lamellae and arranged to endure the mechanical stresses to which the bone is subjected. *Osteoporosis is a state of decreased density of normal mineralized bone. Figure 20-1 Anatomy of a long bone. A pathologic process that interferes with the normal architecture of bone tends to weaken it. Paget's disease is a disease of bone in which there is a disruption of the normal architecture. Patients with this condition are extremely susceptible to pathologic fractures. Skeletal muscle is an organ, the contraction of which produces movement. Ligaments attach bone to bone, and tendons attach muscle to bone. Both are dense connective tissues that offer great resistance to pulling forces. Cartilage is a type of connective tissue with great resilience. It plays an important role in joint function and in determining bone length. A hinge joint permits movement in only one axis: namely, flexion or extension. The axis is transverse. An example of a hinge joint is the elbow. A pivot joint permits rotation in one axis. The axis is longitudinal along the shaft of the bone. One bone moves around a central axis without any displacement from that axis. An example of a pivot joint is the proximal radioulnar joint. A condyloid joint permits movement in two axes. The articular surfaces are oval;thus these joints have been described as ''egg-in-spoon'' joints. One axis is the long diameter of the oval, and the other axis is the short diameter of the oval. The wrist joint is an example of a condyloid joint. A saddle joint is also a biaxial joint. The articular surfaces are saddle-shaped, with movements similar to those of a condyloid joint. The carpometacarpal joint of the thumb is an example of a saddle joint. The ball-and-socket joint is an example of a polyaxial joint; motion is possible in many axes. In a ball-and-socket joint, the articular surfaces are reciprocal segments of a sphere. The hip and shoulder joints are examples of ball-and-socket joints. A plane joint is also a polyaxial joint. In the plane joint, the articular surfaces are flat, and one bone merely rides over the other in many directions. The patellofemoral joint is an example of a plane joint. These different types of movable joints are shown in Figure 20-2. It is necessary to be familiar with certain anatomic terms that refer to position (Table 20-1). The median plane bisects the body into right and left halves. A plane parallel to the median plane is a sagittal plane. 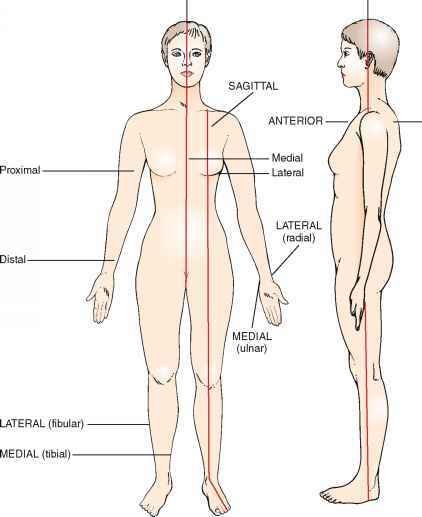 The terms medial and lateral are used in reference to the sagittal plane. A position closer to the median plane is medial; farther from the median plane, it is lateral. In the upper limb, the term ulnar is often used to denote medial, and radial to denote lateral. In the lower limb, tibial is used to denote medial, and peroneal or fibular denotes lateral. These anatomic terms are illustrated in Figure 20-3. The front of the body is the anterior, or ventral, surface, and the back of the body is the posterior, or dorsal, side. The palmar, or volar, aspect of the hand is the anterior surface. The dorsal aspect of the foot faces upward, and the plantar aspect is the sole. Proximal refers to the part of an extremity that is closest to its root; distal refers to the part farthest from the root. The most important terms relating to deformities of the bone structure are valgus and varus. In a valgus deformity, the distal portion of the bone is displaced away from the midline, and angulation is toward the midline. In a varus deformity, the distal portion of the extremity is displaced toward the midline, and angulation is away from the midline. The name of the deformity is determined by the joint involved. A valgus deformity of the knees, knock-knee, is termed genu valgum. A varus deformity of the knee, bowleg, is termed genu varum. 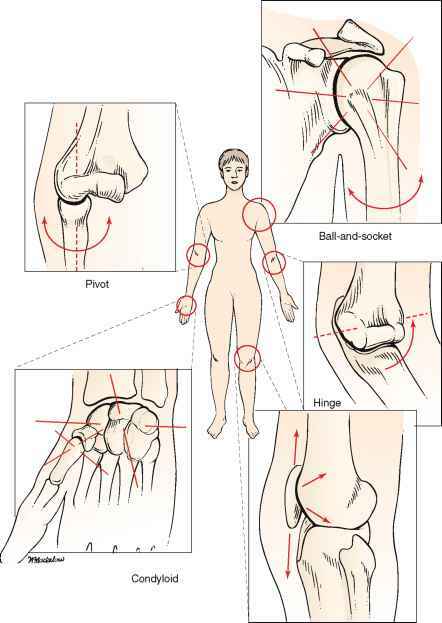 In the evaluation of a joint, assess the range of motion. Each joint has a characteristic range of motion that can be measured passively and actively. Passive range of motion is the motion elicited when the examiner moves the patient's body. Active range of motion is the motion the patient performs as a result of moving the musculature. The passive range of motion usually equals the active range of motion except in cases of paralyzed muscles or ruptured tendons. The range of motion of individual joints is discussed later in this chapter. Joint motion is measured in degrees of a circle, with the joint at the center. If a limb is extended with the bones in a straight line, the joint is at zero position. The zero position is the neutral position of the joint. As the joint is flexed, the angle increases. The concept of range of motion is illustrated in Figure 20-4. The definitions of these motions and the joints at which they occur are summarized in Table 20-2. The anatomy of the shoulder joint is illustrated in Figure 20-5. The joint movements at the shoulder are abduction and adduction, flexion and extension, and internal and external rotation. These motions are illustrated in Figure 20-6. Figure 20-2 Types of movable joints.